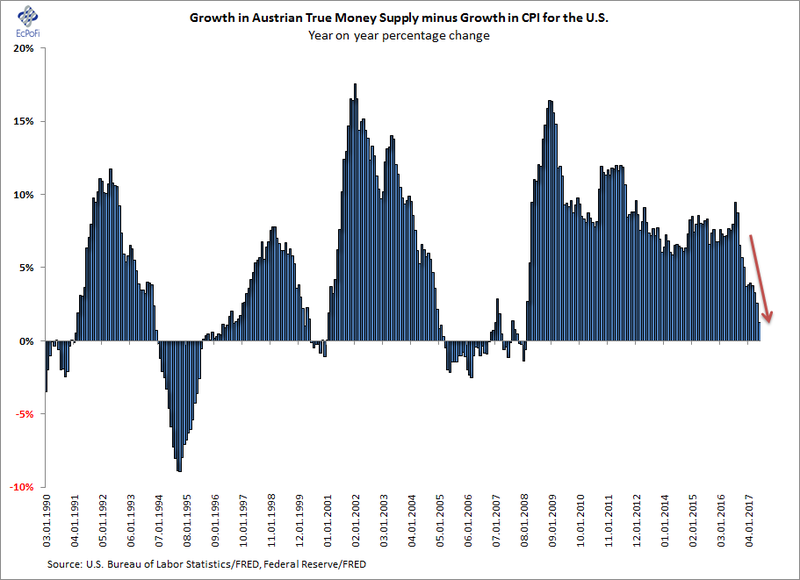 All else remaining the same and allowing for time lags, a high money supply growth rate (which drives earnings) combined with low CPI inflation (which exert downward pressure on discount rates) is in general good for stock prices (justify higher valuation multiples) - the wider the spread the better. Little wonder then stocks have been doing extraordinarily well since 2009. But the spread is now tumbling and is currently the lowest recorded since October 2008 and fast approaching zero - which is very bad news for stocks. In fact, the last two times the spread turned negative, a financial crisis emerged and stocks plunged. With interest rates still near historical lows (but rising) and the longest-spanning period for the last 27 years of a positive positive spread behind us, there is every reason to believe stocks will plunge again once the spread again becomes established in negative territory (which it simply must at some stage as money supply growth cannot outpace CPI inflation forever).